SharePoint Bulk Check in and Approve allows checking in/out large groups of SharePoint documents and files and approving them if approving is required. SharePoint Bulk Check in and Approve allows multiple checking in of a large group of previously uploaded and checked-out documents at one time, and second, approving them (sometimes, when you set up a SharePoint list or a library, you can require approval of the items or files). In the latter case, you can decide whether the files are checked in as published or as draft versions. 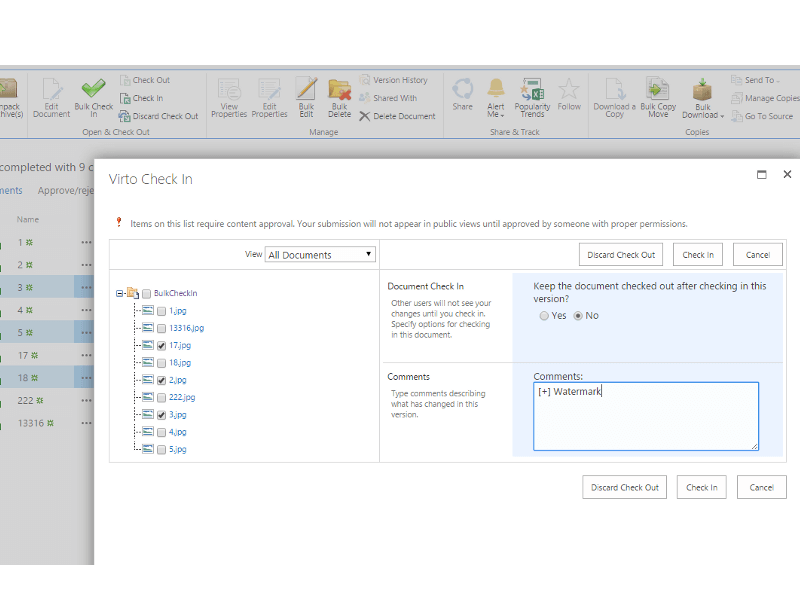 SharePoint multiple documents check-in feature is a part of Virto SharePoint Bulk Operations Toolkit and Virto ONE License and compatible with SharePoint 2016, 2013, 2010 and 2007. 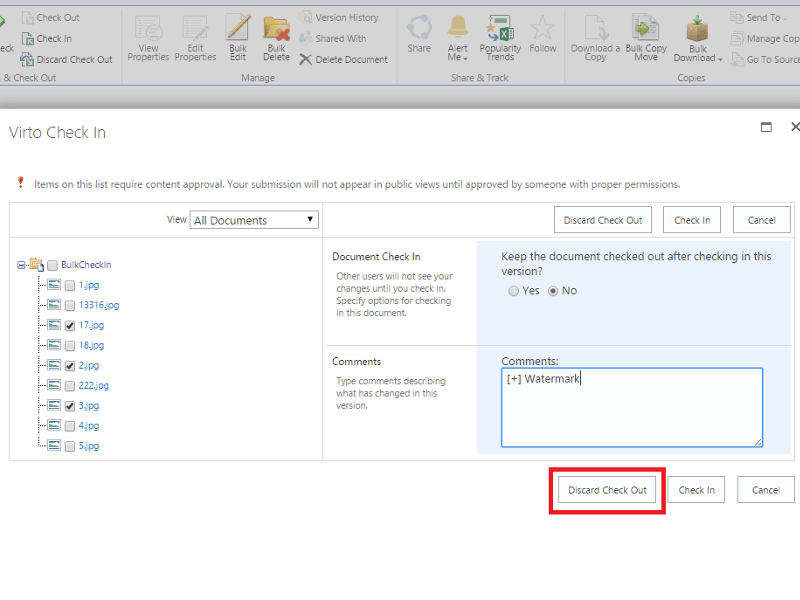 With SharePoint Bulk Check in, you can check in a large group of previously uploaded and checked-out documents at one time with a few clicks. The user can discard multiple checked-out files, without discarding each document manually. When you set up a SharePoint list or library, you can require approval of the items or files. In the latter case, you can decide whether the files are checked in as published or as draft versions. Standard SharePoint content management tools require users to check-in manually every uploaded file and document, form, or picture library; otherwise, they will be left checked-out. If you want to сheck in or check out multiple files or approve them, the procedure will be time-consuming. SharePoint Bulk Check in and Approve solution fixes this shortcoming and allows SharePoint users to bulk check in/out groups of documents with a few clicks and automatically checks in newly uploaded files. Besides SharePoint Bulk Check in web part, Virtosoftware offers a whole series of products for group file management in SharePoint 2007, 2010, 2013, and 2016. Once the components are installed, additional upload, download, delete and move options will be available in all lists of your SharePoint site collection. With these options for multiple operations, any user can easily manage large groups of files with a few clicks. Bulk check in groups of checked-out documents With Virto Bulk Check in and Approve, you can easily check in at once a large group of previously uploaded and currently checked-out documents. Bulk discard of checked-out documents Using Virto Bulk Check In and Approve, you can discard multiple checked-out files, without discarding each document individually. Bulk approval for submitted items With Virto Bulk Check In and Approve, you can require approval of the items or files by setting up a SharePoint list or library. Also, you can decide whether the files are checked in as published or draft versions. I would certainly recommend. Easy way to approve SharePoint bulk files. This sharepoint bulk check helped me alot! Very fast and easy way to sharepoint check in or out large group of files. Just installed it and it helps me alot with SharePoint big data. Thanks for this web-part! Why to solve only 1 task instead of hundreds?